Just some thoughts and a quick look at heat exchanger design. My goal here was to simplify a number of models without getting into too much detail. Satisfying both process and operation requirements when designing a heat exchanger (HX) can be difficult, especially when doing so economically. However, there are some key rules to follow that can make the process more effective. During the design its important to understand the difference between an idealised condition and a real condition. An idealised condition is represented as perfect or better than in reality, and the real condition representing reality, so things like environment and design. 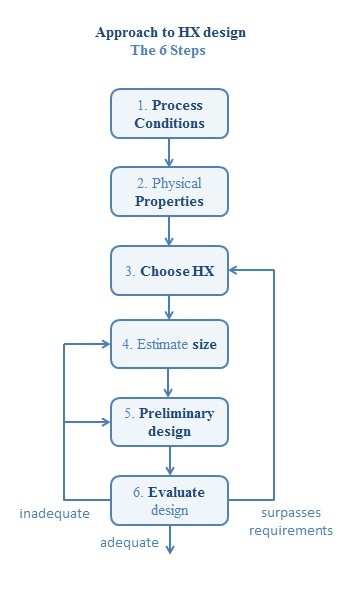 Designing an appropriate HX will test your ability to identify these conditions and apply them in a practical way along with some basic HX knowledge. Designing a heat exchanger is not a highly accurate art even under idealised conditions, so try and avoid wasting time by accounting for every little variable (see my post on Model Development). The six steps are derived from two procedures outlined in “Perrys: Thermal Design of Heat-Transfer Equipment” and ” World Academy of Science: Heat Transfer Equipment”. The main objective here was to create a simplified procedure for the approach to develop a heat exchanger. There are a number of different process conditions, some include: Flow rates of fluids (mass, volume), pressure, temperatures and feed compositions. These will need to be defined in order to progress to further stages, a good place to start would be the “problem definition statement” (Model Development). Try to avoid using idealised conditions in this step. The value of a physical property describes the physical system state, it can be either extensive (depends on amount or size of matter)(ex. mass, volume, entropy, energy, electrical resistance, texture, heat) or intensive (does not depend on amount or size of matter)(ex. temperature, color, hardness, melting point, boiling point, pressure, molecular weight, density). These values need to be obtained for the temperature and pressure conditions of interest, defined in step 1. Based on the process conditions and physical properties, an appropriate heat exchanger unit needs to be chosen. See Heat Exchangers: Types and Applications. It is also important to take into consideration the fouling characteristics, ease of maintenance, expansion considerations, available utilities (cooling water, heating water, power…), material selection (durability, reactivity, thermal conductivity…) and cost. A design is formed from the above steps and all the data required for a mathematical model is collected. Some key things to find: Number of tubes (shell and tube HX), heat transfer rate, overall heat transfer coefficient, tube side and shell side pressure drop (shell and tube HX). Some key considerations for shell and tube HX’s: baffles – if used will increase the heat transfer coefficient, tube layout influenced the heat transfer coefficient, tube size effects shell side coefficient and the shell side flow area varies across bundle diameter (Than, 2008). The mathematical model designed in step 6 is now evaluated for its ability to meet the process specifications with respect to both pressure drop and heat transfer (Perry, 2008). Its important to note there are three outcomes for this step, the model can be either: Adequate, inadequate or too effective at meeting the requirements. You might question the point of the last outcome but it is important in designing the most economical HX unit. If for instance the design is evaluated and the heat-load requirements are more than met or the entire allowable pressure drop is not used, then a less expensive heat exchanger could be chosen (Perry, 2008). If the design is inadequate there are two options: recheck the design or increase the size of the exchanger while remaining within the specified limits. The main purpose of the design in to meet the requirements at the lowest cost while not introducing unacceptable error. Its important not to select an exchanger entirely on the lowest-first-cost basis (capital cost), as things like maintenance, operation and process changes will lead to further costs later on (Perry, 2008). Green, D. W., & Perry, R. H. (2008). Perry’s Chemical Engineer’s Handbook. McGraw-Hill.